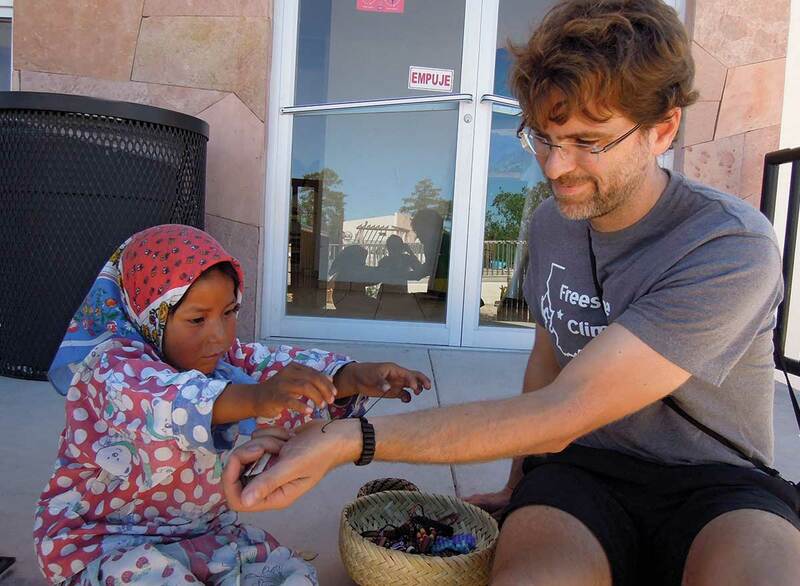 A young vendor ties a bracelet on Morgan’s wrist in the Copper Canyon area of Mexico in 2011. Brian Morgan’s life may have taken an entirely different course were it not for a well-positioned stranger on a return flight to Missoula. It was 1997. Morgan had just graduated from the University of Montana with a master’s degree in economics and was on his way home from a job interview in Washington, D.C. The interview went great, and Morgan was offered the job – a consulting gig for the government. It was a big break for a kid from Montana. And then fate intervened, via seat assignment. Morgan had always enjoyed visiting with strangers, so naturally he struck up a conversation with the man next to him. He told him about the job. Perhaps the man recognized some hesitation in young Morgan, standing as he was, at the threshold of his future. The man asked Morgan about his values and what he wanted in life. So he did. On the advice of some Ecuadorians, he bought a plane ticket to Quito. By the time he left South America 10 months later, he had lifelong friends, a proficiency in Spanish and the kernel of an idea that would eventually become a multimillion dollar company. All of it revolved around a principal he learned early on: Every time you travel, the world gets a little smaller and you get a little bigger. As far as wanderlust goes, Morgan was born with his bags packed. He grew up in Havre, a railroad town of 10,000 people on Montana’s Hi-Line, where his mother sold real estate and his father owned a heating and air-conditioning company. He spent his childhood playing baseball and riding his bike all over town. But Morgan wanted more. In the beginning, he found his escape in books. He read beyond his years. By 16, he was into Dostoyevsky. He graduated high school a semester early and went to Vancouver, B.C., where an uncle hired him to install furniture. It was his first taste of a big, international city, and he loved it. Morgan hoped to go out of state for college. So he drove to Missoula. He settled on a double major of English literature and economics. Morgan was enrolled in the honors college, and he remembers scrambling to keep up with the pace of discussion in his cluster courses. He was used to being an above-average student, but suddenly he was getting Cs, and his papers came back swimming in red ink. Morgan loved it even more when he discovered the exchange programs that allowed students to pay in-state tuition and study out of state. He spent his sophomore year at the University of South Carolina. “As that year finished, I thought, ‘Well why go back to UM now?’” Morgan says. So he signed up for a three-month Russian language program in Moscow. At the end of the course, he found an apartment and got a job as a gatekeeper at the U.S. Embassy. He stayed for seven more months, and his language skills solidified. Back at UM, it didn’t take long for him to finish his bachelor’s degrees in literature and economics. Then he added a master’s degree in economics. He liked the way economics complements literature. That’s when he decided to turn down the safe desk job in D.C. and allocate his resources to seeing the world. Morgan landed in Quito looking for a beach. People had told him that Ecuador had a beautiful coast. Instead, Morgan spent time in the mountains and rainforests of Ecuador, Peru and Bolivia. At one point, the nonprofit Care International commissioned him to write an economics paper on the carbon value of an Ecuadorian rainforest. That gave him money to keep moving. He spent six weeks in Cusco, Peru, where he picked up work as a freelance interpreter for a local guide on the Inca Trail. It was his first glimpse of guiding, and he loved learning the stories of an area and sharing them with travelers. 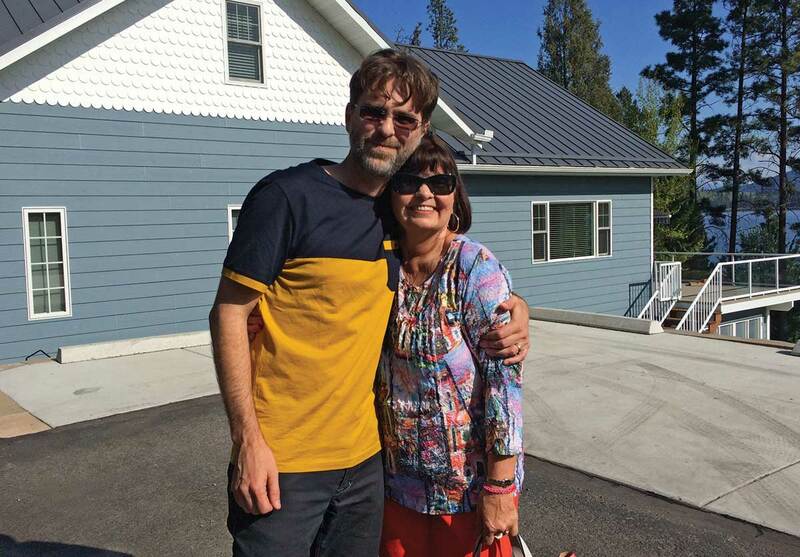 After almost a year in South America, though, Morgan felt Montana calling him home. He applied for all the jobs he found interesting, everything from urban planning in Helena to economic development in Colstrip. But while he was looking for work, he had the idea that he could just plan a group tour to Ecuador. The travelers would pay for his flight, and he’d get to show people around a country he loved. He set to work designing a three-panel brochure on Microsoft Word with plenty of clip art (it was 1998, mind you), which he printed full-color and posted around Missoula coffee shops, sporting goods stores and travel agencies. He came up with a name: Adventure Life. He didn’t have a cellphone yet, so he paid for a call service and waited for customers. “I didn’t get a single call,” he says. Morgan went back to the drawing board. He realized he needed more advance notice on the trips. He needed several different itineraries, departing several times a year. He printed new brochures. A friend helped him publish a website. Another friend happened to work at Yahoo, which was still a human-powered search engine, and he made sure the Adventure Life site came up in web searches. Morgan got a cellphone, and people finally started calling. They were bare-bones days. Morgan was sleeping in the attic of his friends’ house. The attic had pull-down stairs, and Morgan could only stand upright in the center of the room. He kept a $2 Goodwill mattress on one side and a folding table on the other, on which he printed and mailed brochures. His roommate let him use her dial-up internet connection. He had no health insurance, and he drove a borrowed car. “I lived on a lot of frozen pizza,” he says. But people were interested. 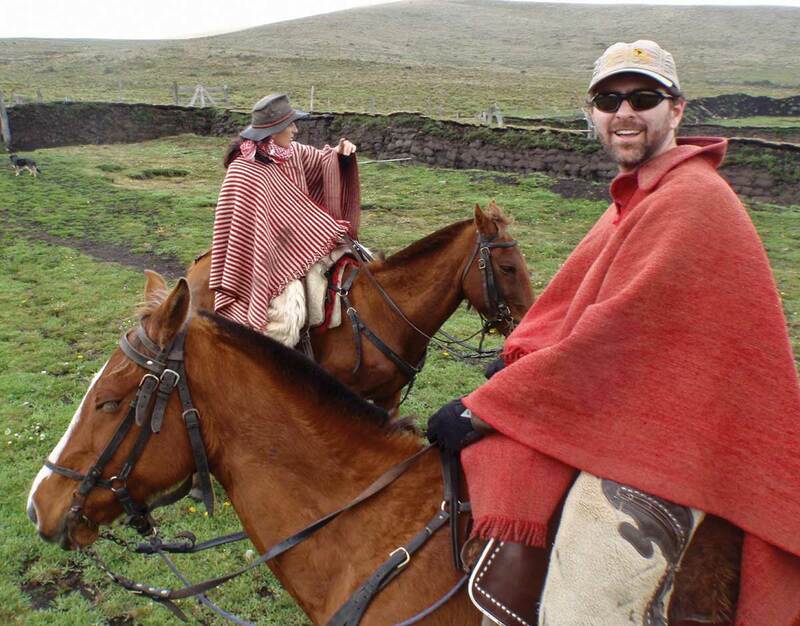 The trips were selling, and before the departure dates, he needed to go back to Ecuador to do more research. So he drove to Havre and handed his mother his cellphone and his dog, Jake. He asked her to look after his dog and answer the phone when it rang – oh, and sell some trips if she could. Betty Ann always had confidence in her son. Betty Ann enjoys a close relationship with her son. He used to sit at the kitchen counter after school and chat while she made dinner. (It’s how he learned to cook.) She admired his ease around strangers. She knew he was destined for an interesting life beyond Havre. When he told her he was turning down the job in Washington, she had faith that it was the right decision. So when Brian traveled back to Ecuador, Betty Ann was willing to take his phone and sell some trips to South America, despite never having been there herself. She answered the phone whenever it rang, even when she was at a wedding dress fitting for her daughter. Communication wasn’t easy in those days. Sometimes she wouldn’t hear from Brian for weeks. Occasionally an unescorted traveler would miss their boat, and Brian would be out of contact. Without any knowledge of Spanish, Betty Ann would have to work it all out from Havre. She could see now that her son had the good sense and the work ethic to keep Adventure Life afloat. Those meager beginnings are a speck on the horizon from Morgan’s current vantage point, the ground-floor office of a four-story building that bears his name. Adventure Life is now headquartered in the $2.7 million mixed-use Morgan Building on Spruce Street in Missoula. When I stopped by the office on a recent Tuesday, an LED screen flashed alluring images of Galapagos, Antarctica and Machu Picchu. A receptionist asked if I wanted coffee. It’s hardly the attic from whence the company sprang. Morgan is 43, with frameless glasses, some gray grizzle on his cheeks and brown hair parted down the middle. His button-down shirt is untucked. The walls of his office are decorated with worldly treasures: There’s a weaving from Peru, a cowhide helmet from Bolivia and the paddle of a dugout canoe that Morgan bought off a guide in Ecuador. On a shelf are pictures of his wife, Naeyshae, and their 18-month-old daughter, Estelle. 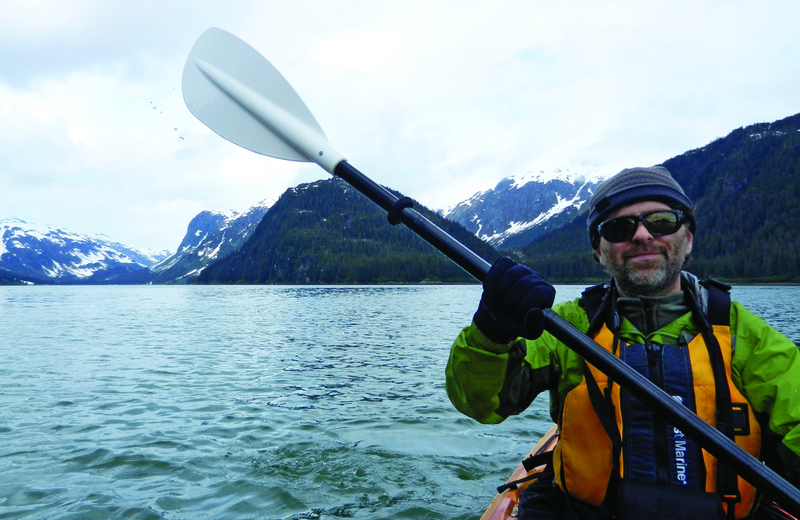 Travel has changed a lot since Morgan first started organizing tours almost 20 years ago. Sites like Expedia and TripAdvisor have made guidebooks and traditional travel agents obsolete. Fewer people want to join group tours, preferring instead to have travel experiences customized for them. 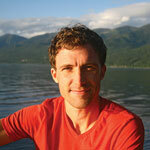 Adventure Life has 26 employees now, all of them well-traveled with deep experience around the globe. Their cubicle walls are plastered with postcards and detailed maps of southern Africa and the Amazon. This year, employees in these cubicles will organize detailed itineraries for more than 4,000 travelers to about 50 countries on all seven continents. Yes, even Antarctica is a burgeoning destination. After all these years, Morgan has never fully quenched the thirst to travel the world that lured him out of Havre as a young man. And thanks in small part to the serendipity of a stranger on a plane, he was able to turn that thirst into a career, and also an adventurous life.